At times, the Hemet High School varsity girls volleyball team fielded a row of Idyllwild-connected players. Here (left and center) Sage Torrez and Rosie Robinson, former Idyllwild residents, and Savannah Loutzenhiser (right), of Idyllwild, prepare to receive the serve from Temecula Valley. 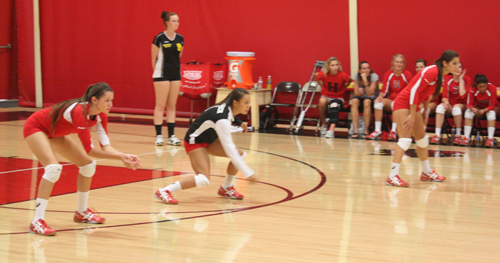 The Hemet won the match 3-0 (25-14, 25-10, 25-11). Alex Sanborn, no. 26, a Hemet High School defensive back, tackles the Perris High School runner during last week’s junior varsity game, which Perris won 20-0. The Hemet High School Cross Country running team competed in the Mt. Carmel invitational last weekend. As the race began, three Idyllwild boys — (from the left) Jayden Emerson, Tanner Torrez and Chad Schelly — started together. Running against 285 other freshman from throughout Southern California and Arizona, Torrez finished 10th, Emerson was 11th and Schelly was 91st. 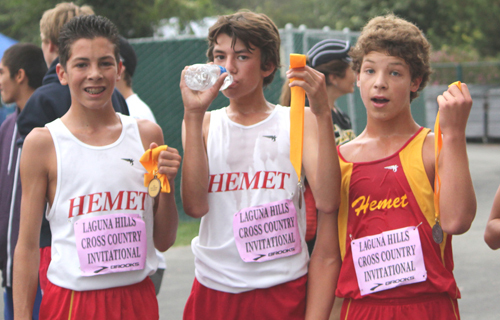 Hemet High School’s freshman cross country team includes three Idyllwild (current and former) students. Shown here are Jayden Emerson-Priefer, Tanner Torrez, and Chad Schelly, all of whom finished within the top 40 runners and earned a medal in their first cross country meet in Laguna Hills Saturday.